A skin tag is a small skin growth that is flesh-colored or slightly darker. The growth is raised from the skin’s surface and is typically no larger than a grain of rice, though some can grow to the size of a grape. Skin tags can form anywhere on the body, but most often develop in areas where the skin rubs against itself. Anyone can develop a skin tag, but growth is more likely in adults. It’s typical for an individual to develop multiple skin tags. Although skin tags are usually harmless and painless, they can sometimes be a source of discomfort. People with skin tags may consider them unattractive. Some skin tags can also rub against nearby skin or clothing and become irritated. They may become painful or bleed. People may have a genetic predisposition towards developing skin tags. Pregnancy, being overweight and obesity are linked with significant skin tag development. Choose a dermatologist at Ascension Seton for skin tag removal. Find a doctor or find a location near you to take the next step. Skin tags are most common in people who are overweight, obese or suffer from diabetes. Most skin tags are permanent unless removed. Growth of skin tags may not be preventable, but steps can be taken to reduce them and prevent more growth. If you are a candidate for weight loss, dropping down to a healthier size may also result in a reduction of skin tags. In general, people are able to self-diagnose skin tags. Dermatologists are able to recognize skin tags by sight. The majority of skin tags present no risk, however skin growths that are hard, multicolored or that bleed should be examined. If your dermatologist is concerned about your growths, a biopsy may be performed to ensure there is no skin cancer. There are several reasons why a dermatologist may recommend removing a skin tag. Growths that are located in very noticeable areas may cause an individual to feel self-conscious, and they may wish to have the skin tag removed for cosmetic reasons. Some skin tags can become irritated if they frequently rub against other skin or clothing. This can result in discomfort and pain. In the event that skin growth appears abnormal, a sample may be removed for further testing. Dermatologists have several simple methods to remove skin tags. Cryotherapy can be used to freeze them off, skin tags may be removed with scissors or a scalpel, or an electric needle can burn them off. This last procedure is known as electrodessication. 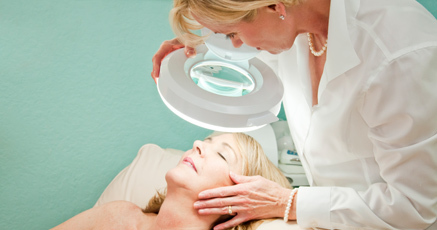 Your dermatologist can determine the best method for removal. An ophthalmologist may need to remove eyelid skin tags. Individuals who are prone to skin tags are likely to develop more. They may choose to have additional skin tags removed in the future. Insurance companies may or may not cover the cost of treating these growths, especially if removal is cosmetic. You and your dermatologist can work together to determine how best to address the cost of removal. Our office offers a cosmetic fee for removal that is usually cheaper than the charge incurred through the insurance company. Fees will often be based on the number of skin tags and how complicated the removal is. Although most skin tags are harmless, there are some instances where removal is called for. Depending upon the method of removal, your doctor will give you specific follow-up care instructions. In general, the treated area may be sensitive for several days afterwards. The site should be kept clean and sun exposure should be avoided.